Dickies features this button-front dress made of Brushed Cotton/Poly Twill (60/40) featuring a notched collar, chest pocket and two lower patch pockets. This dress features a front waistband with button tabs, back elastic for a nice waistline appearance and back and front darts for shaping. White only. Center back length is 38 inches. Sizes available in XS - 3XL. 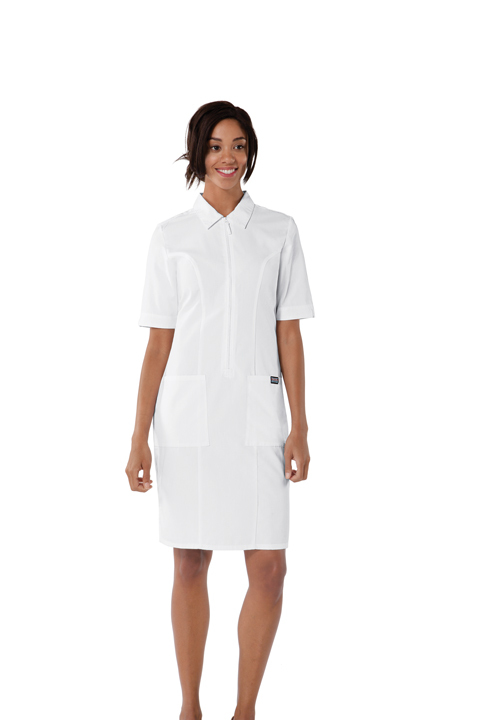 Seek comfort and professionalism in this white, button-front Scrub dress. A button front dress features a notched collar, a chest pocket, side vents and two patch pockets. Also featured are front waistband with button tabs, bust darts, and back elastic for shaping. Center back length: 38".